A convicted killer is "at large" after failing to return to Maghaberry Prison. John Clifford, 56, is serving a sentence for murder and several other offences, including cruelty to children. He was allowed out of prison to attend an appointment but failed to return on Sunday evening. Police describe him as being 1.75m (5ft 7") tall with fair hair, and say he was wearing a hat heavy black coat, grey trousers and black dress shoes. Police said he was last seen using a distinctive three-wheel mobility scooter with the registration plate EXZ4974. 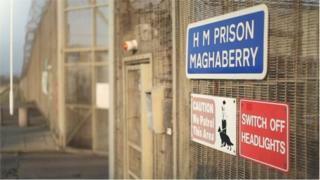 The Northern Ireland Prison Service is investigating the circumstances surrounding the abscondment. Police have made an appeal for anyone who may know of Clifford's whereabouts to contact them.